YOUTHINK Digital Meat Thermometer adopts temperature voice broadcasting system. After the thermometer is inserted inside the deepest part of the meat, simply push the voice button and it will read out the temperature. Suitable for grilling at night or if you wear glasses and open the oven and all the steam comes out fogging your glasses up. LED light function makes display visible if grilling in dim light or camping. Simply push the light button and the screen will brighten to a blue color so you can see the temperature more clearly which makes it easier and convenient when cooking outdoors at night or low light areas. Easy to read from different angles. Powered by 2 AAA batteries (not included) and it automatically shuts off after 10min of inactivity. Automatically turns on when the stainless steel probe is pulled away from the main body. Automatically turns off when the probe is placed back into the thermometer slot. The tapered point on the probe can limit the size of the hole the thermometer makes in the food. It folds up for easier storage in a drawer, travel in camping gear or carry around. 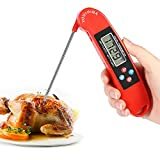 YOUTHINK Cooking Thermometer is the best for numerous kitchen applications, including home grilling, out camping, doing BBQ, cooking duck, turkey fryer, making candy, brewing beer and wine or making chees and bread, even checking babies bath water or milk. YOUTHINK Kitchen Thermometer is at room temperature the instant it is turned on. The back of the package also has a nice chart with different meats and temperatures that works as a reference. ATTENTION: The numbers will be locked when pressing the buttons. It is better to use the functions after the temperature stabilized and the numbers stop moving.